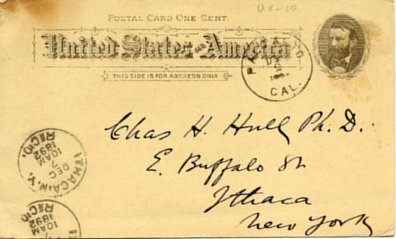 On Dec. 1, 1892 a person who signed his name as "THE" sent a postal card designed to acknowledge gifts to the Library of the Leland Stanford Junior University in California to Charles H. Hull, a faculty member at Cornell University in Ithaca, NY. 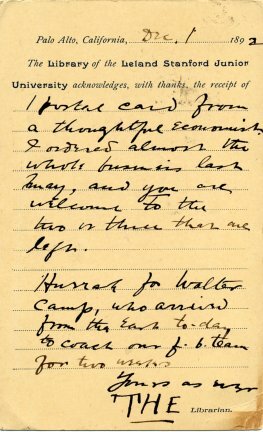 Instead of a gift acknowledgement, however, the postal card contained a personal message part of which read, "Hurrah for Walter Camp, who arrives from the East today to coach our f. b. team for two years. Leland Stanford Junior University is now just plain Stanford University, and it consistently has one of the highest ranked football teams in the nation. The Walter Camp referred to in the postal card is considered to be the father of American football. The identity of "THE" who signed the postal card is unknown. I contacted the Stanford Library but there is no record of someone with those initials being affiliated with the library. The postal card itself is unusual in that it is, at 6 1/8 inches by 3 3/4 inches, the largest postal card issued by the United States Post Office Department. It was issued in 1891 the same year that Leland Stanford Junior University was founded. 1. if you have not yet joined twitter, join twitter. 2. create a profile. in either your user name or bio (or both), use your real name. 3. make your profile public. if you already have a twitter account that is private and wish to keep it that way, create a new account for this class. 4. find and follow all members (students and professor) of our class. also follow GleesonLibrary. although you are not required to follow ITweetUSF, you'd be a fool not to. 5. get into the habit of checking twitter at least once a day. Today is the 135th anniversary of the birth of Charles Clarence Williamson (1877-1965) who conducted a study of the training for library service in the United States for the Carnegie Corporation in in 1919-1921. The "Williamson Report" was completed in 1921 and later published as Training for Library Service in 1923. According to Robert Leigh the Williamson study "became the major program for discussion and action regarding library education for the next quarter century". Williamson conducted his study after working at the New York Public Library as Head of the Economics and Sociology Division and as Head of the Municipal Reference Library. In 1926 Williamson was given the opportunity to put his ideas about library training into practice (or as he said "Put up or shut up.") 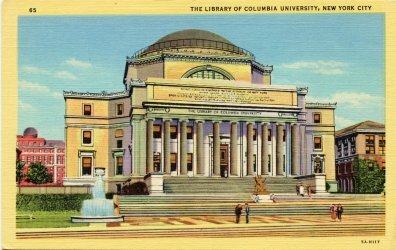 when he received a joint appointment as Director of Columbia University Libraries and as the University's School of Library Service. He served in that capacity until his retirement in 1943. Ironically, Williamson himself had no formal training as a librarian. Williamson's life and library career is documented in the book The Greatest of Greatness: The Life and Work of Charles C. Williamson (1877-1965) by Paul A. Winckler (Scarecrow Press, 1992). Winckler also wrote the entry for Williamson in the Dictionary of American Library Biography (Libraries Unlimited, 1978) which is the source of the information in this post. THE PASSAGE OF THE JARVIS/GANN AMENDMENT RESULTS IN NO FUNDING FOR THE LIBRARY, AT LEAST TEMPORARILY. YOUR REQUEST CANNOT BE FILLED. SORRY. 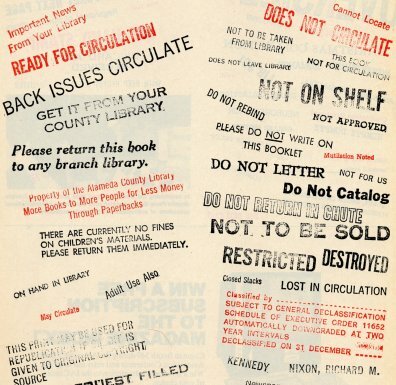 Held ends his article which includes numerous illustrations of stamp messages with this comment: "It appears that rubber stamps may be among the first casualties of the Information Revolution, and that another facet of Americana may vanish. But they have served to remind us of how often clues to the essential nature of things are found in the most commonplace artifacts of daily life." This is why we as a library community should seek to preserve such artifacts. 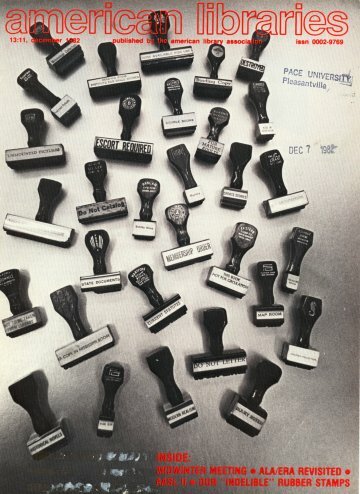 I was the fortunate recipient of a collection of these rubber stamps which were being deaccessioned by a library. A photo of my collection is shown below. Community Garden Outreach introduces students to ideas, skills, and practices in ultra-local, urban-based food production and distribution. Through course readings and discussions, harvesting in the USF garden, running the campus farmstand, and working on group projects, students will gain first-hand knowledge of and experience in ultra-local, urban-based food systems. 3. 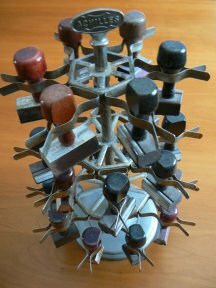 Learn how to collaborate creatively and effectively. This course meets once-a-week for fifteen weeks. Approximately one-third of our class periods will be spent discussing assigned readings and films, sharing ideas and progress on group projects, and brainstorming our next farmstand. Another one-third of our class periods will be spent in cooking and homesteading workshops in the community kitchen at St. Cyprian's Church (2097 Turk Street). A final one-third of our class periods will be spent setting up, administering, documenting, and breaking down our campus farmstands. 33% - Quizzes, homework, in-class assignments, weekly reflections, and class participation. 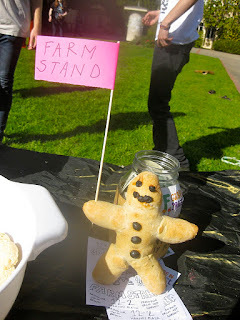 33% - Participation in and contribution to campus farmstands, including designing, setting up, publicizing, preparing food, administering, documenting, and cleaning up. 33% - Individual contribution to group project. This includes: selecting a topic that sustains your attention for a semester; working with other team-members in a collective and generous manner; and devoting at least four hours a week to your project. Missing class, or attending class unprepared, will significantly affect your final grade. If you do miss class, contact a classmate to find out what we discussed in class and ask to borrow his or her notes. Then, do the same with a second classmate. After doing this, if you have questions about missed material, visit me during office hours or send me an email. 1. No late work accepted. 2. No drinking out of non-reusable containers during class.